1971 Mustang Quarter Panel Parts Interchange ? I have quarter panels, quarter panel extensions, trunk lid and tail lights for a 1971 fastback. Are any of these parts interchangeable with my 1973 coupe should I need them?? This will be a yes and no answer. If you're willing to cut them, the lower parts of the quarter panels wil fit. The quarter panel extensions are different on the coupe and the fastback (sports roof) and even on the 1971 Mustang coupe and fastback. As you can see in the picture, the top portions that point towards the trunk lid are longer on the fastback extension pieces. The trunk lid, unfortunately, is a no-go. 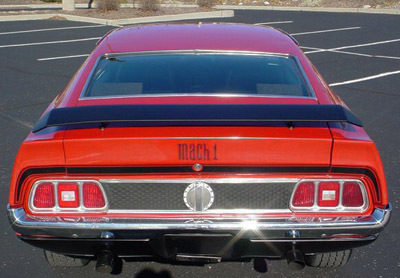 But the tail lights are good for all 1971-1973 Ford Mustang models.